Punitive discipline models for students may be falling out of favor at Chapel Hill-Carrboro City Schools as the district prepares to adopt corrective action policies based on restorative practices. Those practices were briefed to district officials last week by Dr. Philip Holmes, who was asked by Dr. Rydell Harrison to develop a plan that would inculcate them in all 20 local schools. 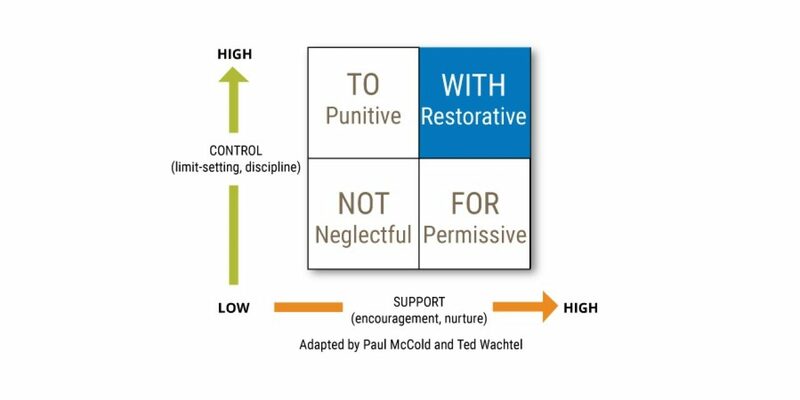 Speaking in his capacity as interim executive director of professional learning, Holmes explained that restorative practices are based on a concept called the social discipline window. That concept cites four approaches used by authority figures to address behavioral issues, with the most effective approach involving more collaboration and less coercion. The practices are already employed at McDougle Elementary School and may be associated with a decrease in student discipline referrals that Harrison relayed to board members. “We see that the number of students with multiple referrals goes down, and so it’s not just a matter of addressing the behavior, but it’s a matter of being preventative so that it doesn’t continue,” he affirmed. An envoy of board members attended a conference held last year by the Institute of Restorative Practices, which was founded in 2000 by Ted and Susan Wachtel. Restorative practices are expected to be fully ingrained in the district by 2020, with the initial phase of implementation focusing on select grade levels and schools.